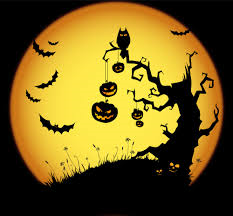 Every 31st October we celebrate the night of Halloween. Pumpkins are carved into jack-o-lanterns, white sheets are ripped in half and turned into ghost costumes, and children go trick-or-treating. These activities are a very modern, rather commercialised, take on a festival steeped in history. 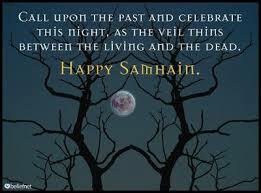 Halloween has its earliest originals in Celtic times, beginning life as a ceremony known as Samhain (pronounced sah-win). A pagan festival that was both a celebration and a thank you to the spirit world that marked the end of the harvest. Traditionally in Gaelic culture, Samhain was a time when records were made of the harvest stocks, and the local population prepared their land and homes for the trials of the winter to come. The pagan Gaels believed that during Samhain, on 31st October, the boundaries between our world and the world of the dead thinned and then overlapped. They thought that the dead would return, bringing sickness to infect the living, and disease to damage the crops. In order to keep these evils at bay, the Gaels dressed up in costumes with masks, mimicking the evil spirits. It was this tradition that is reflected in the dressing up outfits worn during Halloween in the modern century. 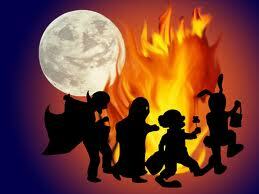 Whilst wearing their evil spirits outfits, the pagans would light bonfires to keep the bad forces at bay. It has also been speculated that the fires attracted insects, and therefore bats, who would come to feast upon them- giving us another symbol of Halloween today. 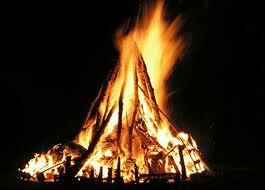 Historians believe that the pagans prayed into the bonfires for the souls of the dead stuck for eternity in purgatory, in the hope that they’d attain release. Another name for Halloween is All Hallows Eve. This dates from 835AD, when the Roman Catholic Church made 1st November All Souls Day; a happy celebration to honour all of their saints. The word for saint in old English is ‘hallow’, and so, the night before All Souls Day, became All Hallows Eve- and then, in time, Halloween. Although the celebration of Halloween can be traced back to the time of the pagan Gaels Samhain festival, the tradition of trick or treating has its origins much later. In the medieval period it became popular to dress up and go from door to door on All Hallows Eve (or Hallowmas as it was beginning to be known). The poor would knock on doors and receive gifts of food in return for prayers to the souls of the dead to be made on All Souls Day. Although Halloween is known to have been celebrated in America from c.1910, and many thousands of Halloween postcards were produced from around the 1920’s showing children celebrating, none of them show the act of trick-or-treating. The term “trick or treat” doesn’t appear in America until 1934, and it wasn’t until after the end of post-war sugar rationing, that trick-or-treating began to become popular. So there you are guys- a very simple guide to Halloween.